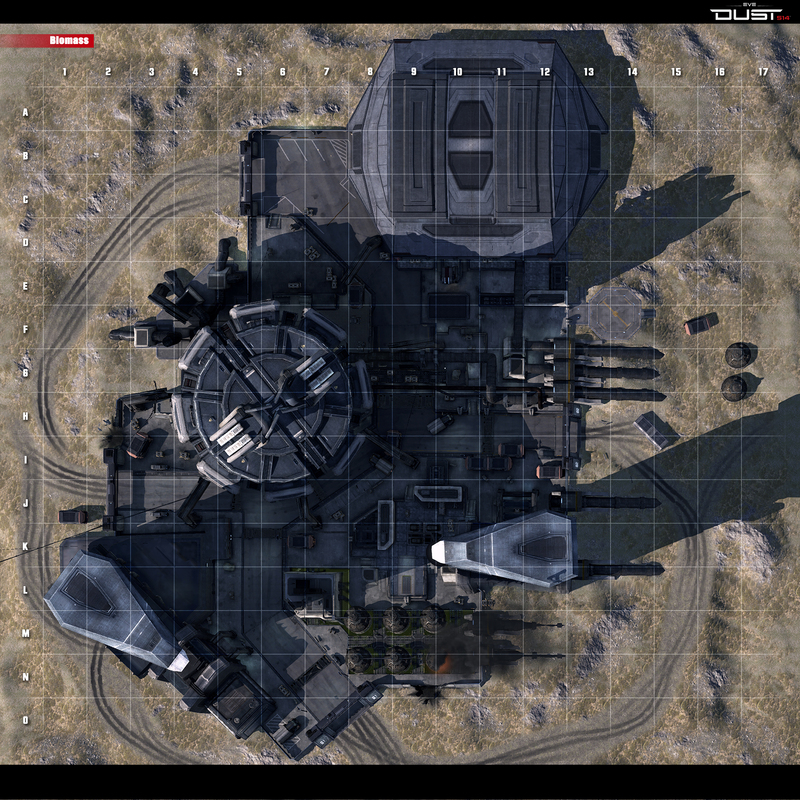 This thread is for specific feedback on the Biomass Outpost map asset as it appears on any map. Please post any issues you have with the map in this thread. If addressing a specific section of the map, please include the grid coordinates included in the image above for easier verification. This outpost provides an advantage to dropships and tanks whose MCC is to the right, as this gives covered access to C and A. On the other hand, dropships starting from the left have no cover from sniper tanks on the right, and sniper tanks on the left have nothing to shoot at. I like how you can make use of roof tops in this map. That said there is ways of fighting against people using the roof tops, and this makes it fine. I like the bridge that goes from the building out. What is normally from B to C. I like how it lets you get above and around tanks on the road bellow. All around I have always liked this facility. A tunnel from somewhere "south" of I connecting to B8/C8 or even C10 could work as you can defend B6 to D9 and D9 to F12 from only two spots (D9 and D11) right now. N9 , n10 and o9 , o10. The blasted out wall or whatever it is is almost impossible to move through you must jump. This is one of the maps that causes memory leak/ frame rate issues. At the very bottom of e11 there is a bumpy wall that can normally be jumped over. Right next to the larger wall, where the bumpy wall is lowest, there is an invisible obstacle that prevents you from jumping through. On the north side of the outpost, if you could make the terrain better suited for ninja'ing around the outside to drop uplinks and whatnot, that would be super. The top of the stairs in H3/I3 are hard to walk over - I have to jump instead. It appears localised to the right side of the top. First of all: Thanks for letting us give feedback on these modular main infrastructure modules. I've wanted to report issues on this Biomass for so long. This structure definately causes client lag and, most distrurbingly, system lag that carries over to following games. It may remnants of that memory leak bug that plagued Line Harvest last fall. The easiest way to get that lag on your PS3 is to visit the biomass fluid are around grid M9. My theory is that the fluid mechanic is something current code/unreal engine/PS3 cannot handle. Slightly less likely reason is the fire and smoke on grid N10. L11 takes a really long time to hop your way up the stack of crates and over the wall- even with a scout. A, B, and C 9-12 Uplinks and nano hives sink into the roof. I always get stuck on the stairs in this outpost. Almost all of them. At the bottom left of N10 there is an overhang from the blasted out wall that one can get stuck under and fall to their death. I've been caught there 4 times and only once did I get out without dying. I'd like a Dev comment on this - whether I'm right or wrong or are they at least checking it? Outside of the Outpost at N10 my corpmate got stuck while walking against the wall, not sure how he got stuck that way though. we had to call a LAV to save him. The tunnel section in D9 seems to have an invisible wall in the upper part - grenades can bounce off of it. I hate this area its soooo jaggie. I got stuck there too. There is a breach in the wall close to the border of N9 and N10. Some twisted metal is protruding to the outside there. I was walking along that wall section in the N10-N9 direction. Tried to squeeze between that metal scraps inside the outpost. Instead i got stuck in it. Did some turning around and jumping and manged to free myself. Maybe consider to add some invisible wall or turn collision detection on that twisted plates to make them passable. It is a deadly trap. Same character as in this post. I was using Gallente AV starter fit. The ground close to gate side at H13 on the outside of the outpost is sticky. I was not glued but could move very slowly and could not jump. Maybe this stickiness is related to the pipeline nearest to this area? There's a graphics issue with a crane jib thing on the edge of the tower in L12 it pops in and out of existence . You can see it on the map picture as a shadow. Here's a strange event that occurred last night. Somehow, a squad got an uplink under the main mesh around C on the Biomass socket. @ E to F: 10 to 11. I'm not sure how they got down there, but judging by how there was more than one squad at one point, I think they dropped an uplink while the team thought they were spawning outside. I wasn't able to get much closer to take a picture because they could shoot through the floor and kill people (or somebody was nailing me with MD rounds and a FG from around there. Around H7, throwing a grenade against a crate causes it so sink and there's one crate that you can get snagged on while walking. Around G11, there's two larger wall pieces separated by a transition material of sorts of a darker color, that you can walk straight though, and even drop uplinks inside. Reds did it to us in a match tonight, though we were also able to walk through, once we saw where they were going, and kill their uplink. I just want to Say Kudos to Etrne for putting in a PICmap of the socket with a grid.Where players can tell Devs exact locations. This wouldve saved us so much time back in the closed beta with terrain glitches. There were alot that I just didnt feel I would be able to tell them exactly where they were or if we would be talking about the same spot.